Synthetics get used just as much in my rotation as 2-band badgers. My preferred synthetic remains the Chubby 2, but for some time I've been trying the Plisson type and black synthetic knots. There are now a number of inexpensive synthetic brushes with Plisson type or black knots, but these generally don't have handles comparable in quality to top tier badger brushes. If you want a premium synthetic brush with a Plisson or black synthetic knot, you have to go custom. This is the route I've taken, and used two of these brushes to compare the Plisson type with the black. These are the two brushes I used for my comparison. In the left is a Doug Korn with a 26mm black knot, set to a 55mm loft. On right is a Bob Quinn / Elite Razor with a 26mm Plisson type knot set to a 54mm loft. I've used these brushes for multiple shaves, including some in which I used both during the same shave. Based on my experience, which is all I can opine on, I have these general thoughts on the Plisson type v black comparison. 1. The knots are comparable in terms of density, backbone, flow, and ease of creating lather. 2. Softness is a close call. I initially thought the black was just slightly softer. However, with repeated use, there were times when the Plisson type seemed just slightly softer. My conclusion is that a they are so comparably soft that I can't consistently differentiate between them on this basis. 3. Appearance is entirely subjective, depending on one's color preference. The individual fibers on the black appear slightly larger in diameter to me. Additionally, the individual fibers on the black are noticeably more squiggly than on the Plisson type. Neither one of these resembles an actual badger knot, but the black is more shiny and seems more "synthetic" to me. 4. Both types of knots have significant glue bumps. After handling several of the loose knots, I've found that the Plisson type generally has a larger glue bump than the black. However, with both types the glue bump won't be noticeable above the handle until the loft exceeds 55mm. 5. I like the loft at 55mm, because I favor backbone and scrub. At 55mm though, these don't splay a lot and feel smaller than a 26mm badger set to the same loft. The available synthetic brushes with these 26mm knots typically set the lofts over 60mm. I find 60mm+ too high, but a loft of 55-58mm would also work quite well and give you more splay without a meaningful loss of backbone and scrub. Having used both, my personal conclusion is that the performance of these knots is close enough that I can pick between them on the basis of which one looks better to me. 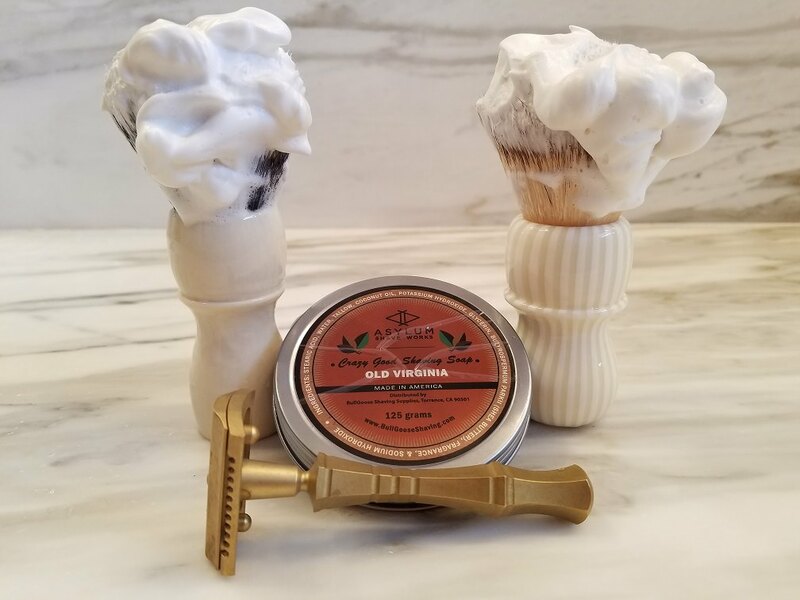 My final test shave with these brushes was this morning. 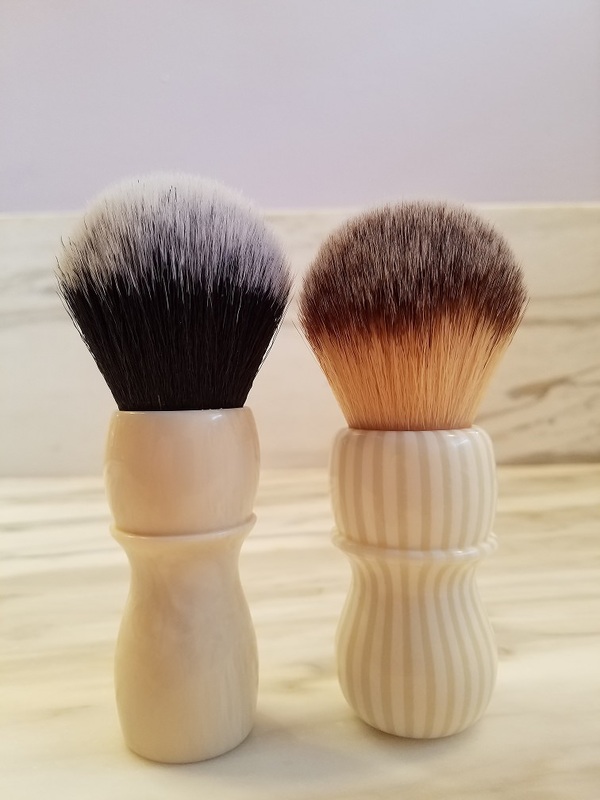 I used both brushes for my usual three pass shave. I then lathered a fourth time even though I did not do a fourth pass. I wanted to feel the softness of the fibers after three passes, when my skin is more sensitive. I used the Brass Asylum Evolution XL-T, which is currently on tour here: http://shavenook.com/showthread.php?tid=51301. Thanks for the write up Ricardo. This is very instructive, particularly for a synthetic newbie such as myself. Nice write up Ricardo! I recently tried both Plisson Type offerings as I really like the true Plisson Synthetic. I came to a similar conclusion regarding softness not being able to pick one over the other. Ultimately I kept ahold of my Original Plisson and passed the others on to my son. These are some great looking brushes. I have always wondered how the Simpsons brushes compare to the Tuxedo knot and the Plisson type know. I’d love to get a custom made Duke 3 type handle with either a Plisson or Tuxedo type knot in it as that handle from Simpsons is lovely and by far the best I’ve ever used. I've read there are relevant differences between sources of sub-types of knots. I have very limited experience and cannot compare between sources, but I like the original tuxedo. While the quality of the later from synthetic knots is great, I think natural bristles work in lather a bit better. Wouldn't be surprised if I run a test and find there is no noticeable differences though. Ricardo, as always, this was a well planned and written review. Thanks for sharing your opinions. I (and many others, I’m sure) appreciate the chance to learn when reading your experiences with products. You provide a very valuable service to the community. Thank you.